Just a general observation today that I can not help but ponder. Upon attending mass this morning and seeing the wonderful display of Our Lady of Guadalupe inside our church, I was brought to question something. Something so sad I can not help but mention it. If I am missing something here, or anyone finds fault with what I am about to say, I am sorry. Forgive me, and help to change the way I am seeing this today. In 1531 a “Lady from Heaven” appeared to a humble Native American at Tepeyac, a hill northwest of what is now Mexico City. She made a request for a church to be built on the site, and submitted her wish to the local Bishop. When the Bishop hesitated, and requested her for a sign, the Mother of God obeyed without delay or question to the Church’s local Bishop, and sent her native messenger to the top of the hill in mid-December to gather an assorment of roses for the Bishop. After complying to the Bishop’s request for a sign, She also left for us an image of herself imprinted miraculously on the native’s tilma, a poor quality cactus-cloth, which should have deteriorated in 20 years but shows no sign of decay 479 years later and still defies all scientific explanations of its origin. It apparently even reflects in Her eyes what was in front of her in 1531. 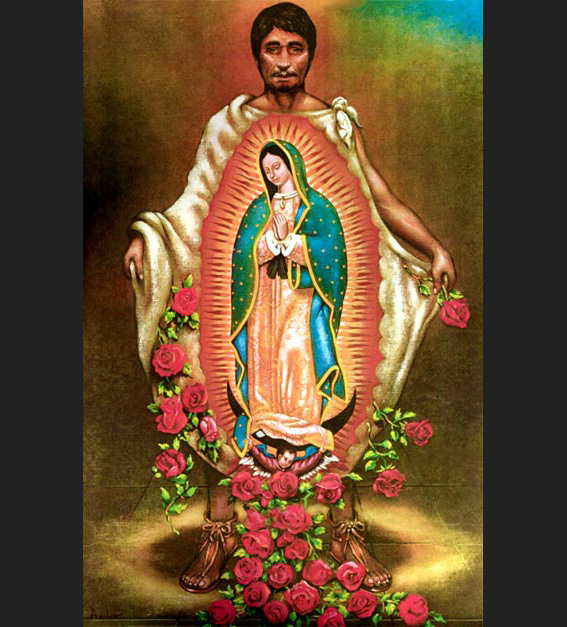 Her message of love and compassion, and her universal promise of help and protection to all mankind, as well as the story of the apparitions, are described in the “Nican Mopohua”, a 16th century document written in the native Nahuatl language. As I arrived at mass this morning, in the courtyard were many tents set up and scores of souls celebrating the feast day set for tomorrow. Vendors were selling statues and other items, including lots of food in booths. It was a carnival atmosphere. Many souls gathering together to eat, drink and celebrate. Its a feast! But where are they when our Lord is calling to them. Granted I am sure Mama Mary is honored, but at the price of leaving her Son, our Lord unattended, I can only ask for forgiveness and see no need to partake of this sort of feast. Yesterday, I was saddened because I had received many calls from souls sitting in our Blessed Sacrament chapel, who had no one to release them. For the past few weeks, since Thanksgiving, many of our Adorers have stopped attending and we have been left with gaping holes in our Adoration schedule, in where the same souls sit with our Lord, in prayer, for several hours longer then the one hour they had signed up for. Keep in mind, our parish is over 70% Hispanic, but there has been a huge lack of response to get the over four thousand parishoners to participate in Adoration of the Blessed Sacrament. When Our Lady of Guadalupe first requested that a “church” be built in 1531, one was built. The “Church” is the place to worship her Son. The “Church” is where holy mass, the True Feast, is celebrated. From the Holy Mass, we attain Our Lord in complete humility in the Blessed Sacrament, and for the past few weeks, He is being left alone in the “Church”, His mother, our Holy Mother, requested to be built.